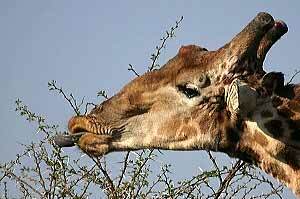 An adult giraffe eats up to 34 kg (75 lb) of foliage a day. You'd think, to get that much down it's throat, it wouldn't have time to be selective. Yet that's not the case. 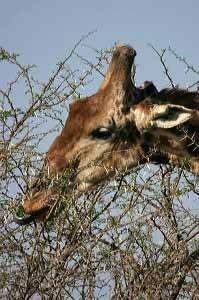 Same as us, giraffes also like tasty titbits and when they find a source, will happily spend time plucking small, succulent leaves from the top of a tree. 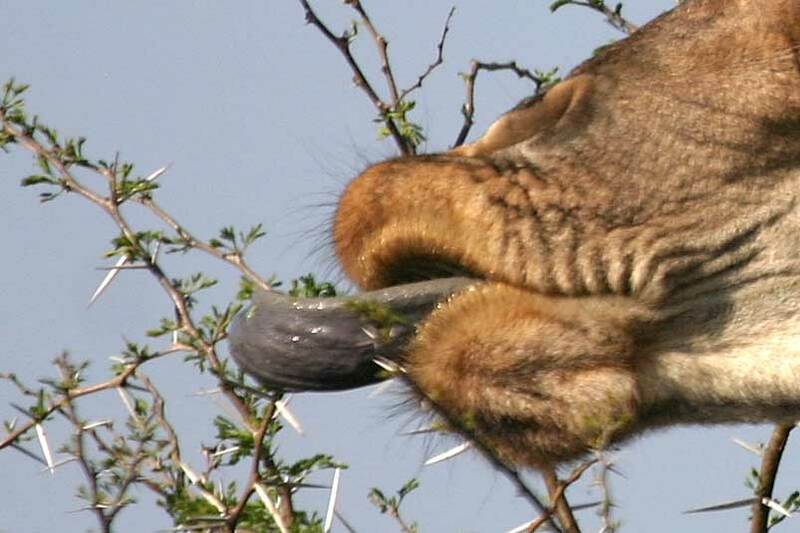 The familiar, umbrella-shaped thorn trees of the African savannah provide one such favored source. 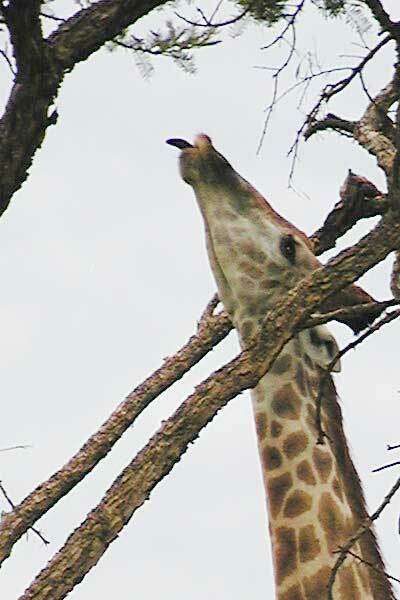 The picture below (left) shows an adult male giraffe about to start feeding on a thorn tree in the Weenen Game Reserve, a smallish nature reserve in South Africa's KwaZulu-Natal province. 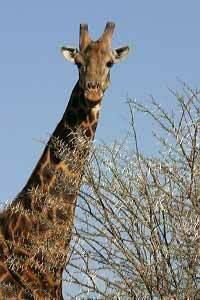 I was able to approach fairly close on foot and watched, fascinated, as the giraffe began browsing, sticking its long muzzle deep into the thicket of spiny branches. 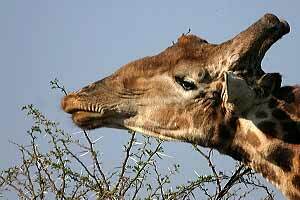 Unconcerned by the mass of thorns, the giraffe flicked his long tongue around selected twigs, stripping away the green leaves - see picture below, right. Click on the picture for a detailed view. 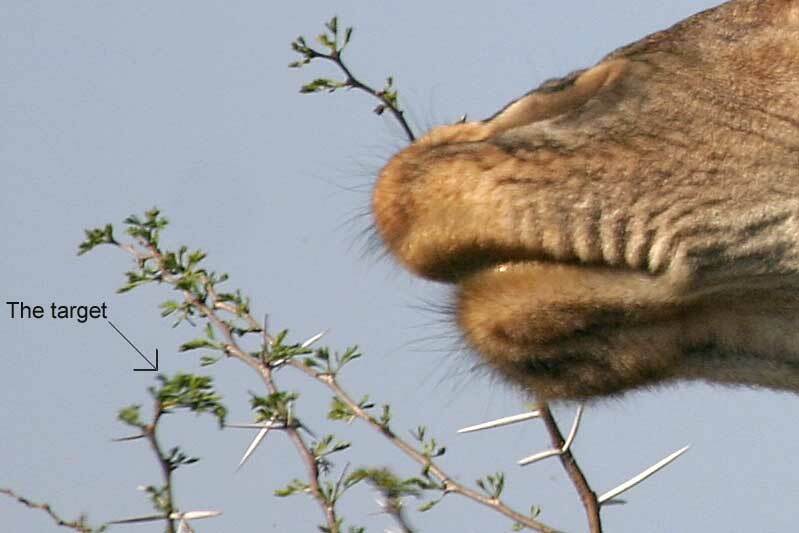 "Horny papillae (small bumps) protect the lips and tongue against thorns. 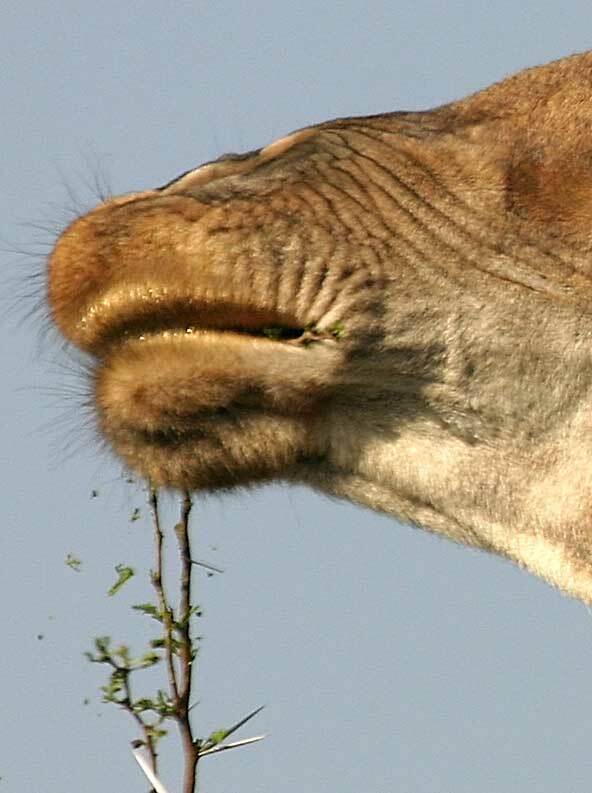 The narrow muzzle, extremely flexible upper lip, and long, prehensile tongue enable the giraffe to strip leaves off branches or select individual leaflets from between sharp thorns; thus it can both feed selectively and consume the quantity of foliage needed to sustain its bulk." 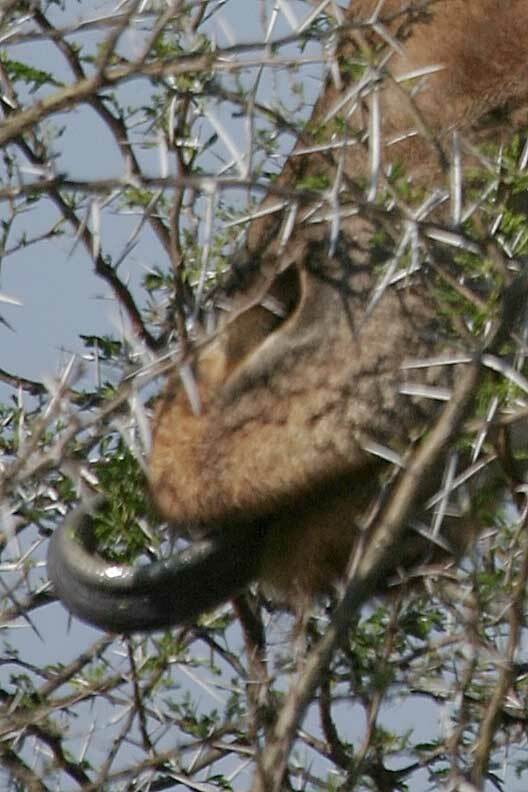 To see how the giraffe "selects individual leaflets from between sharp thorns", see the two pictures below. On the left, the giraffe has his eye on a tasty morsel. Notice how the muzzle is twisted as he lines up, ready to pounce. On the right - "Gotcha!". Can you guess which sprig of leaves he's selected? Click on the pictures for a closer view. 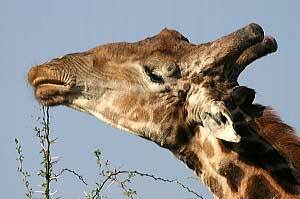 And finally, a picture showing how the giraffe takes a twig in his mouth, swivelling his muzzle as he strips away the tasty leaves, plus a picture of a giraffe at full stretch, tongue at the ready, taken at Tala Private Game Reserve. 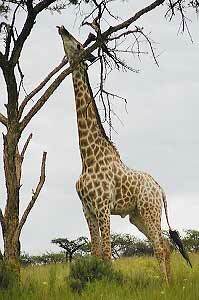 See also The Giraffe is Truly Unique for more on this African wildlife icon.